The WorldStar Competition is one of the pre-eminent international awards in packaging. Organised by the World Packaging Organisation (WPO) to advance packaging design and technology, the 2015 awards were recently handed over at the IPACK-IMA expo in Milan, Italy. On May 19, 2015, over 90 winners of the WorldStar 2015 awards gathered at IPACK-IMA to receive their WorldStar Awards. There were only two SA entries, and two SA winners! 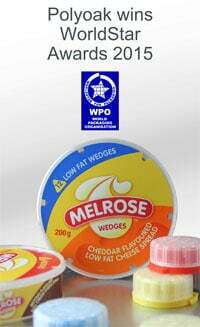 Both by Polyoak who won WorldStars for its Melrose Cheese Wedges pack, and child-resistant closures.